The Atami Ito ferry route connects Japan with Japan. Currently there is just the 1 ferry company operating this ferry service, Tokai Kisen. The crossing operates up to 2 times each week with sailing durations from around 25 minutes. Atami Ito sailing durations and frequency may vary from season to season so we’d advise doing a live check to get the most up to date information. The city of Atami is a Japanese coastal resort famed for its volcanic hot springs. The city’s name translates into English as “hot ocean”. Lying on the eastern coast, it provides stunning views across the crystal blue Sagami Bay and with its positioning on the Izu Peninsula, the area is blessed with hot summers and lined with long sandy beaches. The city centre houses some popular tourist destinations, including the MOA Museum of Art, Atami Castle and the Kiunkaku Former Ryokan. Atami is a popular retreat for city dwellers due its easy commute from the centre of Tokyo. Atami is a terminal on Japan’s famous high speed train network, with regular hour long train journeys making it easy for visitors to escape the stresses of life in the capital. By road, the extensive Tomei Expressway cuts through the city and along the rugged coastline, to both the north and south. The port can be found just minutes from the city centre, with buses that pick you up and drop you off outside the terminal. The ferry port of Atami connects the Japanese mainland with the Izu Islands with services provided by Tokai Kisen. There are numerous sailings on a daily basis with journeys ranging from twenty five minutes to around two hours. The port services four destinations around the Izu Peninsula. 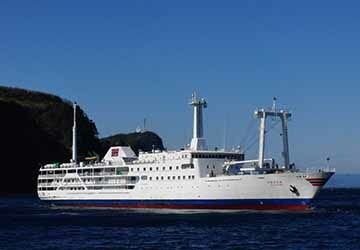 Tokai Kisen sails to the mainland ports of Ito and Inatori to the south, as well as the island terminals of Kozushima and Izu Oshima.